At times we joke that we should change our name to Rick’s burger joint. Without a doubt people love our burgers. We start with medium ground beef. Yes, the fad is to use lean or extra lean ground beef. However it’s the fat in the medium ground beef that gives a burger it’s beef flavour and all of it’s juices. We take the fresh ground beef an add a mixture of 7 different herbs and spices. It’s this mixture that makes our burgers so loved. And, no! We do NOT use any filler in our patties. Eggs yes, filler no. 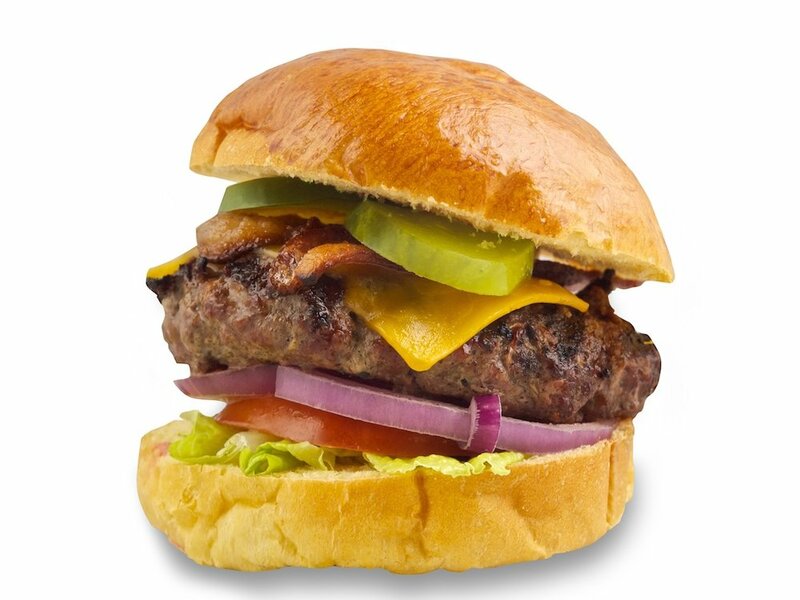 All burgers are cooked on our grill for that true BBQ flavour. We then finish the burger with a custom made bun. Add real cheddar cheese and bacon or just man up and do the Stack it high. Peameal, 1/4lb pulled pork and cheddar cheese. Go easy on the condiments and enjoy the taste of a real burger. You wont be disappointed.